Have I mentioned that we're a busy family? I know most families these days are busy -- with work, schoolwork, sports and everyday life. While I wish I could prepare meals from scratch every day, throughout the day, the truth is that I can't. Oscar Mayer has re-vamped their Lunchables with some new varieties and I jumped at the chance to try them out when Mom Central asked for bloggers to review them. 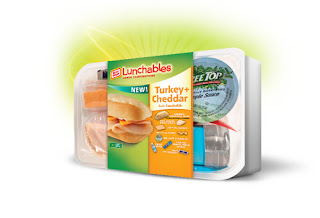 They sent me a coupon for one, and I picked up 3 of the Turkey & Cheddar Sub Lunchables. These are great for a lunch when schooling and sports and work has taken over our day. Lydia's favorite part was the applesauce. My boys both liked pouring the powdered Kool-Aid into the bottle of water and shaking. All three ate the sub sandwich (although Lydia did her usual of taking one bite of bread, and then eating the insides. This isn't any comment on their bread - that's just how she eats sandwiches.) All three also ate the Nilla Wafers. These are great to have in the refrigerator for those days we need the fastest lunch possible -- or those days the kids are at the sitter and I need to make their lunches at the last moment in the morning. My kids don't like American cheese, so I won't try the cracker meals, but we will buy the subs again. Check out their site for all the varieties, as well as all nutritional information.